This is one of my favourite spring outfits for those days when it isn’t too hot and it isn’t too cold. 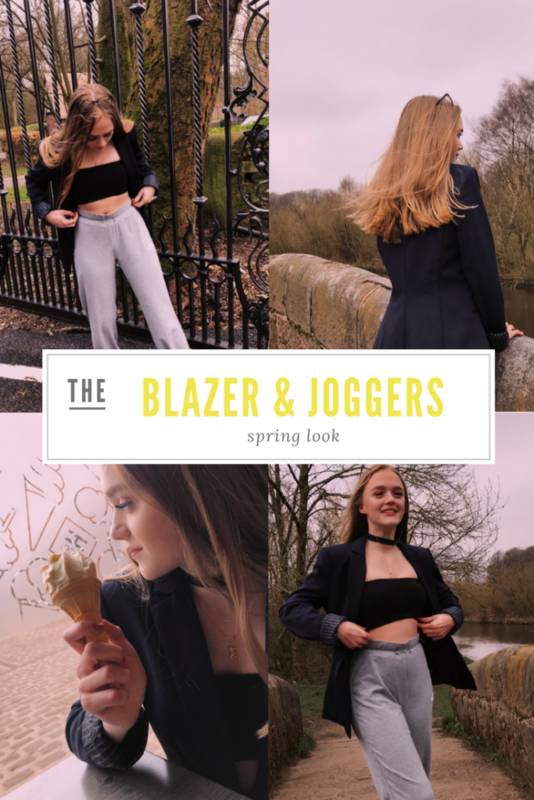 Teaming really comfy joggers with a bandeau top and a smart blazer is a look you’ll see a lot this spring, and if the weather does warm up, just take off the blazer and you’re still left with a great look. You can easily use accessories to dress this look up or down, it’s a really versatile outfit and all of the pieces can be used separately in other looks so they’re great buys. I love my silver metallic Calvin Klein trainers that I wear with this look – these are super versatile and so comfy – these are the trainers I get the most use out of. Can’t get enough of these Nike gym vintage joggers from ASOS. Just can’t go wrong with some gorgeous metallic trainers like these Calvin Klein ones. Sometimes I like to up-cycle pieces of old clothing and turn them into something new – making your own bandeau top is really easy – just grab yourself an old t-shirt (I used my dads) you want something that is made from stretchy material so it fits to your body better. Cut a strip big enough to fit around your chest – you can hem the edges if you like – or just keep them rough and fold them under – then simply wrap around your chest and tie at the back – if you want it a little more secure – use a hair bobble to secure it tightly before you tie.